If you find yourself constantly plugging and unplugging HDMI cables from your TV, then it may be time to buy an HDMI switch. Most people have a handful of game consoles, digital receivers, and video players in their entertainment center. But most TVs usually have just two or three HDMI ports, a frustrating design choice that can turn a simple game night into a complicated adventure behind the TV. If only you could add more HDMI ports to your TV! Well, it’s clear that TV manufacturers aren’t going to suddenly start bulking up TVs to house more ports, so you have to take matters into your own hands. An HDMI switch is the easy cost-efficient way to add more HDMI ports to your TV, and it can actually help you organize all of the messy cables that have snaked their way around your entertainment center. But there are a lot of HDMI switches to choose from, and they all serve different functions that will inevitably appeal to different people. Some HDMI switches are the size of a DVD player, but they’re usually remote-controlled, and easier to organize down the road. 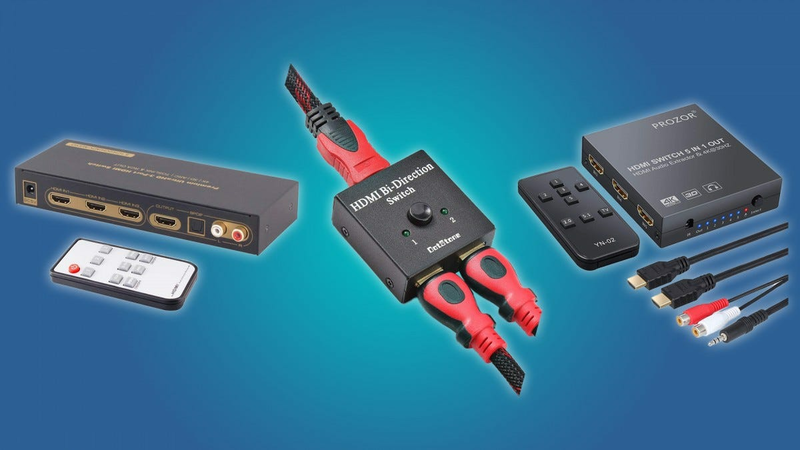 Some HDMI switches are small enough to hide behind your TV, but you may find yourself digging around to choose your video source or to reorganize your setup. 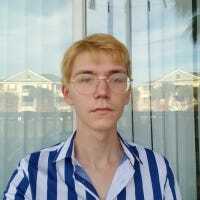 Here’s a little something for everybody. Not all TVs, projectors, or computer monitors have audio outputs. 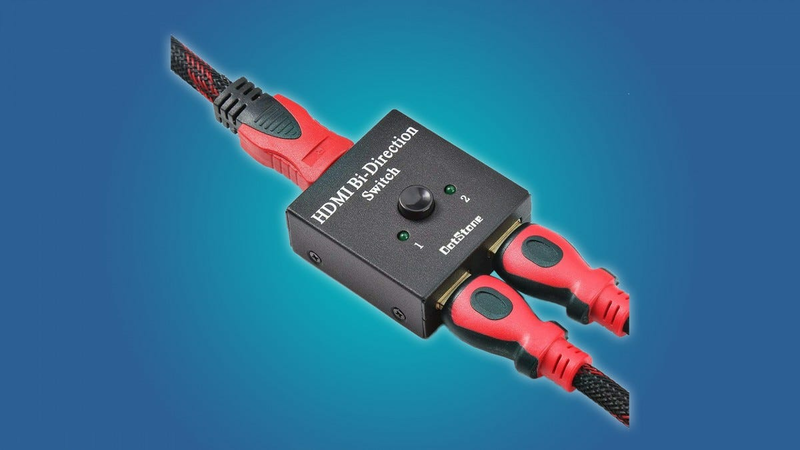 This isn’t a big deal for most people, but if you want to use external speakers in your entertainment setup, then you should consider getting an HDMI switch that supports audio extraction. 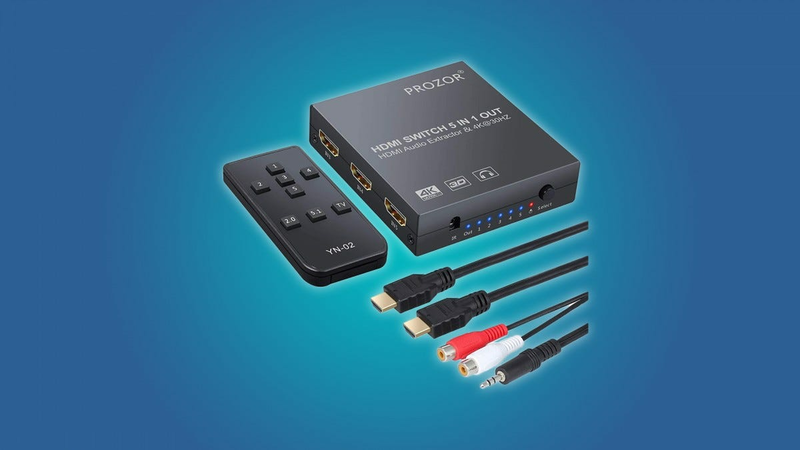 If you’re looking for a semi-automatic remote-controlled HDMI switch that has audio extraction capabilities, then you should check out the Proster HDMI switch. Its five HDMI inputs support 4K and 3D, so you don’t have to compromise quality for convenience. Plus, it has an auxiliary output and optical audio output for external speakers. The Proster also has an automatic function that, when active, can automatically switch to whichever source is outputting video. The Proster is also small enough to hang behind your TV, which is a plus for anyone that wants to keep their entertainment center looking clean. It requires power from a micro-USB cable, but that’s to be expected from such a powerful little device. The iArkPower is a nice, premium HDMI switch. Its three HDMI inputs support 4K and 3D, and it has an RCA output and optical audio output for external speakers. This device also comes with a remote control, and it has an automatic feature that can be toggled on and off. 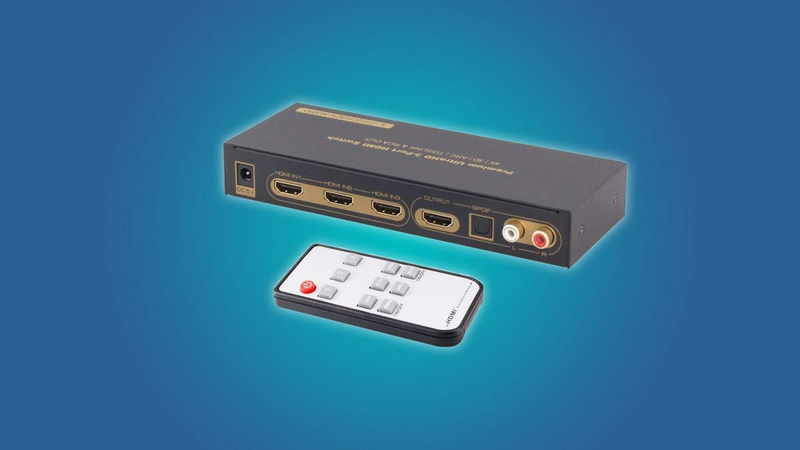 Really, this is an HDMI switch that you don’t have to hide behind your TV. All of the ports are on the back of the device, so it looks good and is easy to access. This is a good HDMI switch for entertainment centers that don’t have a lot of hiding space, or for situations where you’ll be plugging and unplugging different video sources. If you’re looking for an affordable HDMI switch that won’t use up to much space, then you should consider the Gana HDMI switch. It has three HDMI inputs that support 4K and 3D, and it doesn’t require any external power, so you can plug it straight into your TV and go to town. Honestly, it’s amazing that you can find an HDMI switch like this for just $9. It doesn’t have any automatic features, a remote control, or any audio outputs, but this is still a great device for anyone that needs to add some HDMI ports to their TV. For cases where you just need to toggle between seldom-used devices (like older game consoles or a DVD player you rarely turn on), it’s worth the hassle of pressing the selector button. People tend to confuse the terms “HDMI switch” and “HDMI splitter.” A switch allows you to plug multiple devices into a TV, while a splitter lets you plug a single device into multiple TV’s. Both devices are useful, but they’re essentially opposites. And that’s why the DotStone bi-directional switch is so interesting. 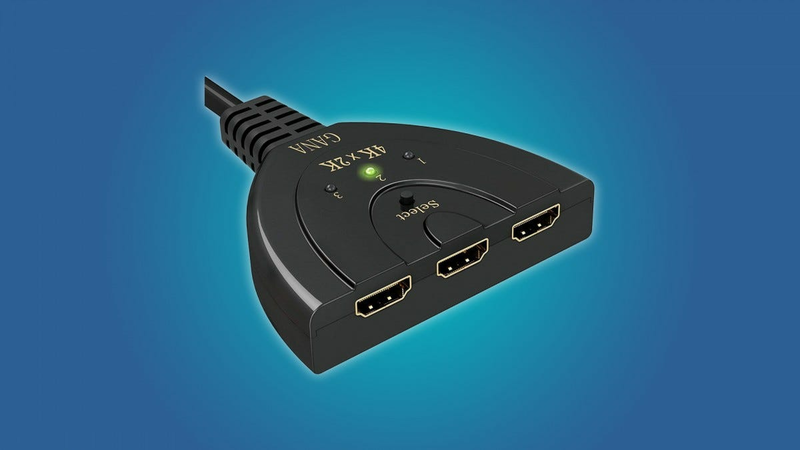 It can function as a two input HDMI switch, but you can also use it as a dual output HDMI splitter. This is a great device for people that work with a lot of tech, because it’s as small as a pack of gum, yet extremely versatile. Not to mention, it doesn’t require external power, so you could use it just about anywhere. If you’re just trying to add more HDMI inputs to your TV, then you should go for the similarly priced Gana HDMI switch, which has one more HDMI input than the DotStone. You should also consider that the DotStone has no remote control or audio outputs, so you may have some trouble using it from the couch with some external speakers. If you’re looking for the behemoth of HDMI switches, then you should take a look at the Monoprice. 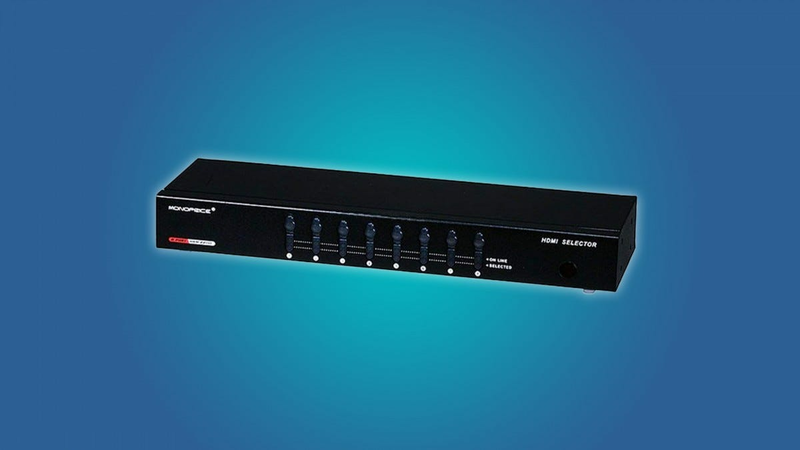 It has eight HDMI inputs, so you can run your entire home video setup through the device. It doesn’t have any options for audio output, but if you’re this invested in your home cinema, then you probably have a receiver or such that supports audio output. Oh, and the Monoprice comes with a remote, so you don’t have to get up to switch between inputs. This is the kind of device that you can proudly display in your entertainment center. It’s housed in a good looking metal case, and won’t stand out among your Blu-Ray players, digital receivers, and game consoles. Thank goodness it looks, well, good, because there’s no way that you could hide a switch this beefy behind your TV. Should You Buy An Apple Pencil With Your iPad? The Pencil is Apple’s official iPad stylus. There are two versions: the first generation Apple Pencil ($99) and the second generation Apple Pencil ($129). If you’re reading your article then you’re probably wondering should you buy a Pencil and, if so, which one should you buy. Let’s dig in.